In order to establish what the likely value for USU’s equity, we need to understand the underlying dynamic behind the stock and the broader market in which it operates. USU supplies low enriched uranium for commercial nuclear power plants worldwide. The company also performs contract work for the United States Department of Energy (“DOE”) and related contractors. The opportunity with USU revolves around the American Centrifuge Project (“ACP”), which deploys advanced US gas centrifuge uranium enrichment technology to fuel commercial nuclear power plants. To date, over $5 billion has been invested by the American government and USU in this technology (http://www.usec.com/american-centrifuge/what-american-centrifuge). The ongoing cash burn and uncertainty around the ACP is what has lead USU to its precarious position – USU owes $530 million to bondholders on October 1, 2014 and has no resources available to it with which to pay. USU raised $575 million in convertible senior unsecured bonds in 2007 with high hopes. From this amount raised, $530 million remains outstanding. With only $128 million of cash on hand, and a business that is not generating any cash flow, the company does not have the funds to repay these bonds. Recognizing this reality, bond holders trading in public markets have valued the bonds at 37.0 cents on the dollar. Acknowledging the impending crisis, USU has embarked on the path of restructuring given its inability to refinance at anything approximating similar terms. So let’s take a look at their proposed plan. The restructuring plan released on December 16, 2013 proposes an issuance of new common stock to each of: existing shareholders, bondholders and convertible preferred holders. The most important aspect of this reorganization is that it will result in a Chapter 11 bankruptcy filing on or before March 7, 2014. The proposed plan will replace the current $530 million in bonds with new debt and redistribute the majority of the existing equity of the company. 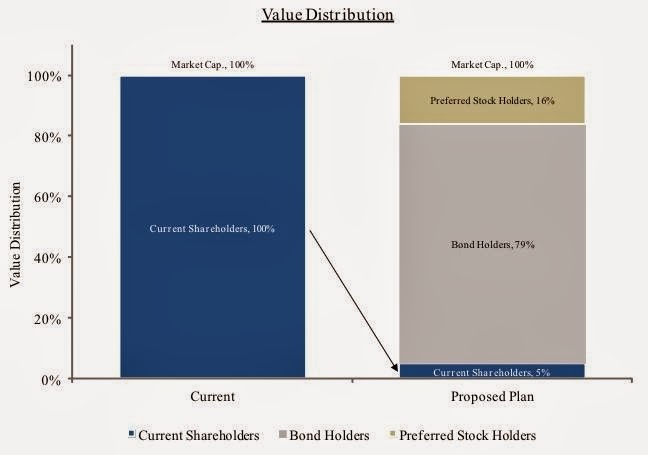 Only 5% of the reorganized equity is allocated to existing shareholders as bondholders will attain the majority of the remaining value. Bondholders will receive $200 million in new notes and 79% of the new equity. Convertible preferred shareholders, Babcock & Toshiba, will receive 16% of the new equity. This is not the first time that this has happened to retail investors. Similar situations existed at Excel Maritime Carriers (OTCMKTS: EXMCQ) and Patriot Coal Corp (OTCMKTS:PCXCQ). In both, “hope” buyers bid up the trading values, but inevitably each ended as a donut. USU’s circumstances are even more clearly cut with an “agreed” bankruptcy whereby the key takeaway is that existing shareholders will be subject to 95% dilution. As can be seen in the chart above, existing equity holders stand to lose the vast majority of their holdings through dilution. These calculations do not even address a liquidation scenario, a non-negligible possibility, where the equity holders would almost certainly get nothing, a 100% loss from today. As can be seen in the calculations above, equity holders stand to lose significant value when accounting for the planned dilution. The current bonds have a market value of $196 million ($530 million face value of bonds outstanding trading at 37.0 cents on the dollar) and we will use this as a proxy for enterprise value (market cap + net debt). Let us assume the new bonds have a market value of $150 million (issuance of $200 million trading at 75 cents on the dollar). The implied new equity value is worth $58 million (($196 - $150) / 79%) of which existing equity holders will receive 5% or equivalent to $0.59 a share ($58 x 5% / 4.9 million shares outstanding). This represents a loss of approximately 90% when compared to current share price. If you are interested in investing in a restructured Usec Inc., the best way to do this is the current bonds which trade at 37.0 cents on the dollar. A shareholder is reasonable to take a gamble on the future of the company, but why have an investment with an all but certain ~90%+ loss right away. These bonds will attain $200 million in principal amount of new notes issued by USU and will respectively retain greater security than equity. Further, current bondholders will receive 79% of the new equity allowing you to participate in upside of the company and more importantly, an option on the ACP. On the November 5, 2013 earnings call, John Welch (CEO): “Our Board of Directors met at the end of October and we are pleased to have two additional directors join the Board. Michael Diament and Mikel Williams are successful businessman who have extensive experience in corporate governance. Their selection was made in consultation with certain note holders and I expect their experience in restructuring will prove valuable to the board.” The board member additions, selected by bond holders, were added to assist with the ongoing restructuring given Mr. Diament’s prior experience with bankruptcies and restructurings. Finally, USU stated its intended path forward on December 16, 2013 “In order to implement the terms of the agreement, USEC Inc. expects to file a prearranged and voluntary Chapter 11 petition for relief in the United States Bankruptcy Court for the District of Delaware in the first quarter of 2014.” The details of this agreement state that this is even required to happen by March 7, 2014: “USEC fails to commence (A) the Solicitation or (B) the Chapter 11 Case in the Bankruptcy Court on or before March 7, 2014”. 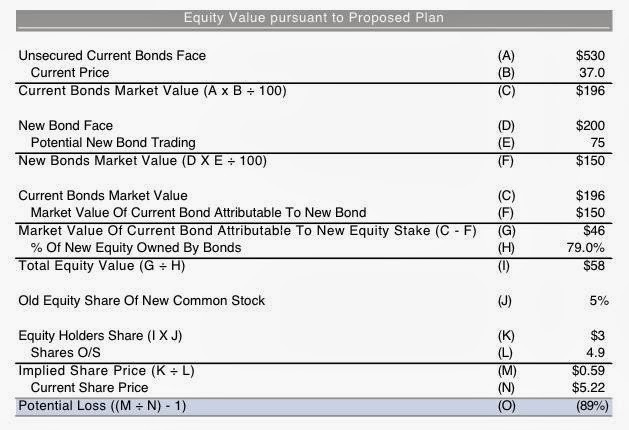 I think that new shares will be issued for the face value of bonds so the implied value is about $4.30. The current price of bonds suggests that new holders of shares will have a big incentive to sell. The price of stock will go below $4 only after the new shares come into play. Stock should probably go below $1 when they file BK. The mutual funds will be forced sellers, and who is going to buy? Why are the shares still listed on the NYSE? It looks like the bonds are trading now for $26 after USEC has been reduced to a subcontractor on the ACP. But, the equity still trades like there is more to be gained. What do you make of this? What keeps this equity from flushing down the drain already? The facts have only gotten worse.